What follows are recipes for all the bacon-y things I served at my Super Bowl party. I think I purchased six pounds of bacon in prep for it. The whole apartment complex smelled like bacon while I was cooking. It. Was. Incredible. I served Bacon Jalapeño Grilled Cheese Sandwiches, Beer Candied Bacon, Bacon Wrapped BBQ Chicken Bites, and Bacon Wrapped Cheese Stuffed Hot Dogs. The one thing I didn't taste test was the hot dog, as I didn't want a full blown heart attack after the event, but at the rate they disappeared off the plate, I'd venture to say they were a crowd pleaser. I'll start with the grilled cheese. 1. Prep the peppers (this can be done in advance) - Broil the peppers on high for 4 minutes on each side, so the skins are charred and crackly. Remove from oven and immediately put peppers in a ziplock bag, or other airtight container, and close it up. Let set for 15 minutes. Remove and proceed to peel off as much skin as possible, and scrape out all the seeds. I recommend wearing plastic gloves if you don't want your hands to burn for hours after. Set aside, or refrigerate overnight if you've prepped ahead of time. Baked peppers, being sliced, seeded and skinned. 2. Prep the bacon (this also can be done in advance). Cook it. However you want to. Until it's crispy. I like cooking it on foil on a pan in the oven at 425 degrees for 10-15 minutes. Set aside, or let cool and then wrap in foil or plastic to refrigerate over night if you've prepped ahead of time. 3. Slightly soften the cream cheese in the microwave. Mix in grated cheese. Spread cheese mixture on one side of all pieces of bread. Put a layer of peppers and a layer of bacon on half of the slices. Top with an additional slice. Thus making a sandwich. Do I need to elaborate? 4. Melt a bit of butter in a pan. 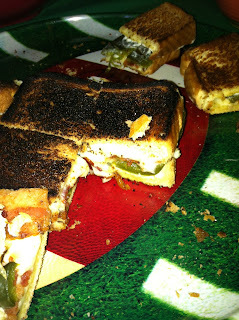 and fry the sandwiches for about 4 minutes on each side, until the cheese is all melty and the bread is browned. Helps if you press down on the sandwiches periodically as they're frying. Thoughts: Why are they called grilled cheese sandwiches instead of fried cheese sandwiches? Were they traditionally made on a grill? Google search is imminent.